We conclude our Meet the Missing People Choir series on the day of the Britain's Got Talent semi-finals! 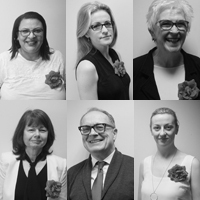 This week we're excited to talk to Pam Sargent, Rachel Edwards, Tony Parrack, Anne Hetherton, Nelda Johnson and Karen Robinson and find out what motivates them to sing in this very special choir. 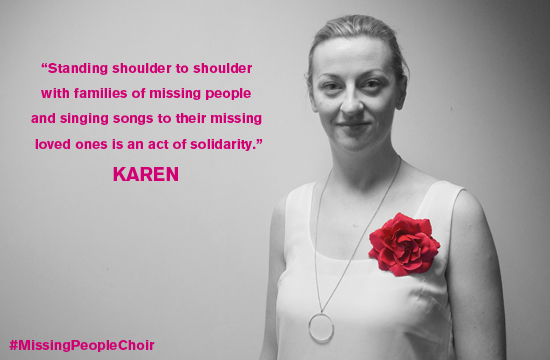 Why did you join the Missing People Choir? Pam: I am a volunteer (on the back of my brother going missing many years ago) so will support the charity wherever I can. I also love singing and feel that singing is an incredibly powerful, effective and simple way of communicating a message to a large audience. Tony: I joined the choir because of friends who are members. It’s a small way I can help a charity with a big heart. 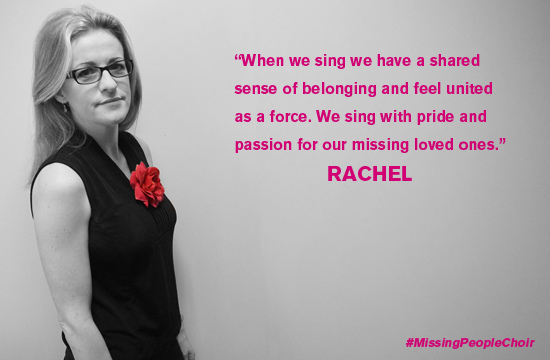 Rachel: I joined the choir as an opportunity to meet up with other families who share the experience of having a missing loved one. Karen: I’ve worked for the charity for six years, and seen first hand how much missing people and their families need the charity’s support. Standing shoulder to shoulder with families of missing people and singing songs to their missing loved ones is an act of solidarity; I don’t know what it’s like to walk a day in their shoes, but I can help them spread a message of hope to their loved-ones and beyond. 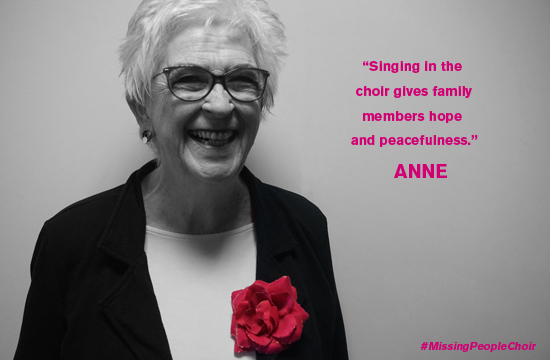 Anne: I was invited to join the choir to support new singers and family and friends of missing people who may join. What does it mean to you to be part of the choir? 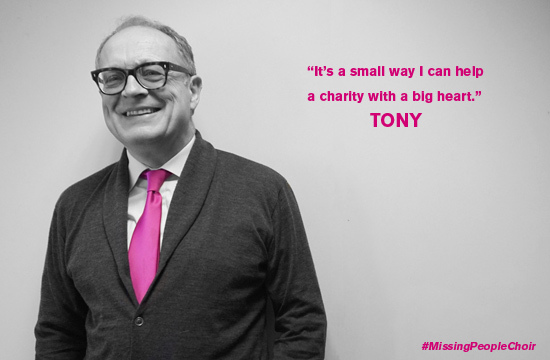 Tony: I do feel emotionally involved with those who have family members missing. Initially I found the singing quite overwhelming and difficult because it strikes a nerve with me: how lucky I am that this has not happened to one of my children, or a family member. I am a small part in this – a foot soldier – but I do hope that I am playing a small part in a much larger ‘thing’. 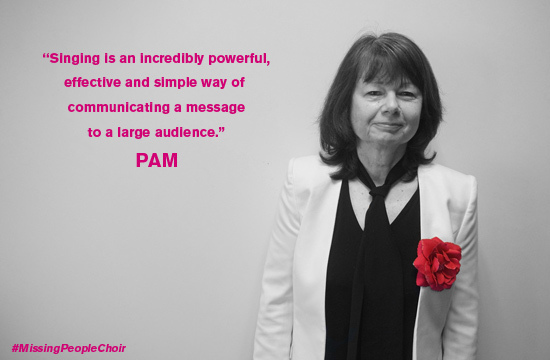 Pam: I am honoured to be able to use my 'voice' in a choir that has a purpose not only to support those people who have experienced loved ones going missing but also promote the Missing People charity. I really feel that I am doing something worthwhile when I sing with the choir. Rachel: I feel honoured to be a part of this choir. When we sing we have a shared sense of belonging and feel united as a force. We sing with pride and passion for our missing loved ones. Karen: I feel like we have become a family – we support each other on and off the stage. For example, while we were waiting for our BGT audition I had half the choir helping me come up with a new name for my basketball team! Only a few hours later we were sharing words of encouragement as we nervously waited backstage to perform. It’s very bonding. What’s your favourite song that the choir sings and why? Nelda: I Miss You is my favourite. From the first time I heard it, it encapsulated everything about what the families and friends of missing loved ones go through. Pam: I Miss You, because the message and arrangement is beautiful, simple, moving and it is written by a member of the choir whose family member is still missing. Rachel: I Miss You evokes our sense of yearning and aching for our loved ones and our dream that one day we may see them again. Karen: I Miss You gives me goosebumps every time I sing it. It’s the closest I can come to understanding what it’s like for families who are missing someone. The lyric; ‘I’m so empty and silent without you’ captures the agony that families experience, and is the reason I feel so proud to work for the only charity in the UK who can support people through the emptiness. Anne: Mine is also I Miss You. There was such a strong feeling of collaboration and support during a very emotional creation of the choir. What is your favourite Missing People Choir memory? Karen: Singing I Miss You at the charity’s annual carol service. I was so nervous at first I could barely sing, but I kept my eyes glued to Jim – our strong and brilliant leader. By the second verse I was calm and able to fully appreciate the moment and the importance it had for the many families who were there to remember there missing loved-ones. 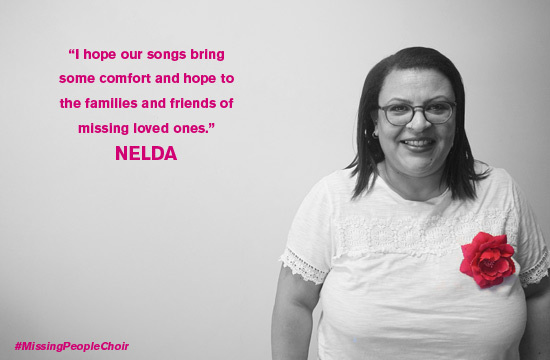 Pam: When I first joined the choir in October and we sang I Miss You The emotion in the room was incredibly moving and I thought 'I am now a member of this amazing choir singing with a purpose'. What did you enjoy most about auditioning on Britain’s Got Talent? Tony: Hearing all the support from the audience when we finished singing: all the cheering and people shouting ‘press the buzzer!’ for what seemed like ages. The great texts afterwards from my daughter who was in the audience, saying how everybody was standing up and clapping, and how proud she was. Karen: The actual performance itself felt incredible. It felt like we had climbed a mountain together. All the hours of practice and the waiting around were worth it to stand in front of a huge audience and tell them our story through the song. The audience’s reaction was breath-taking! Pam: The way the choir and Jim (choir director) worked together as a team, resulting in an amazing, emotional, truly heartfelt performance from each and every one of us. And then seeing the audience and judges giving us a standing ovation. I felt immensely proud that we had achieved our goal on behalf of missing loved ones and their families, and the Missing People charity. We could not have done anymore and it is very rare that I ever feel that. Rachel: It was a privilege to sing in front of the Judges and audience and, whilst we sang, images of our missing loved ones were displayed on a screen behind us. It was such a visible and powerful sign to highlight and remember those who are missing. In that audition we sang for them in an act of shared celebration and remembrance of them. Tune in to ITV this evening (Friday 2 June) from 7:30pm to watch the Britain's Got Talent semi-finals featuring the Missing People Choir.